Fun and Creative ideas for Teaching English: 3-D Recycling: Grind, melt print! A new desktop recycler turns trash into 3-D printer ‘ink'. Three-dimensional, or 3-D, printers make it possible to “print” almost any object with a computer. The machines produce items by laying down tiny drops, or pixels, of material one layer at a time. That material can be made from plastic, metal or even human cells. But just as the ink for standard computer printers can be expensive, 3-D printer “ink” can be quite pricey too. Meanwhile, society faces a growing mound of plastic trash. 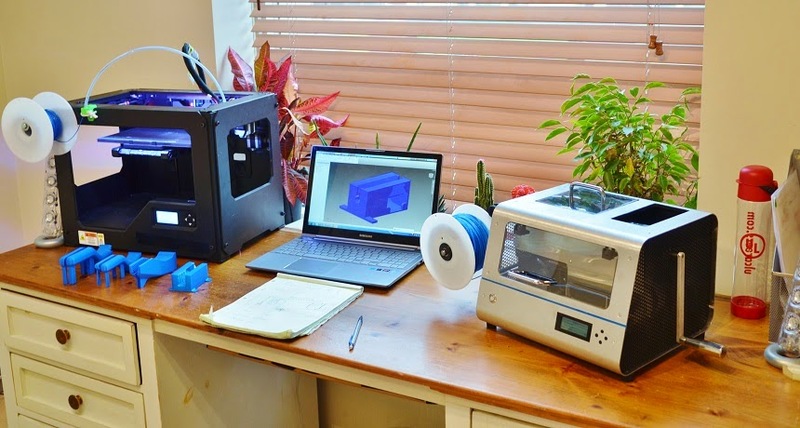 Now three Canadian engineering students have found a way to deal with both problems: Recycle plastic waste into spools of 3-D printer ink. The first part of their new machine is a plastic recycler. It grinds and crushes waste plastic into uniform bits about the size of peas or large grains of rice. The waste can be used drink bottles, coffee cup lids or other plastics. But this trash must be clean. Users must grind only one type of plastic in any given batch. Otherwise, the ink-making part of the process may not work well, notes Dennon Oosterman. He worked on the new machine with fellow students Alex Kay and David Joyce. All three attend the University of British Columbia in Vancouver, Canada. The machine stores the plastic bits in a drawer until there are enough for a spool of “ink.” Then those bits go into the next part of the machine. It’s called an extruder. To extrude something means to push it out. To do that, this part of the system first melts the plastic bits. A little of that melted plastic attaches to a spool. The spool then turns, pulling a long, thin thread of the plastic out of the machine. “You can think about stretching gum apart,” explains Oosterman. But instead of becoming a mess of stringy goo, the plastic cools and winds neatly onto the spool. The machine pulls out and winds as much as three meters (10 feet) of plastic thread per minute. At that rate, it takes roughly two hours to make a one-kilogram (2.2 pound) spool of plastic thread. That’s about 40 percent faster than other small-scale plastic-ink makers, Oosterman says. Those other models use a huge screw to churn plastic through a heated tube. In contrast, the students’ design breaks the process up. “We’ve separated the screw from the melting and mixing,” says Oosterman. Their machine is also smaller. Its tube measures about 15 centimeters (6 inches). Other machines can have a tube up to five times that long. Just as a small toaster oven uses less energy than a full-size oven, the new machine uses between one-third and one-tenth as much electricity as other models do, Oosterman says. As a result, it costs less to run. Being able to use recycled plastic cuts ink costs even more. Of course, no one will want to bother with the machine if it’s too tricky to run. Thus, different types of plastics will have preprogrammed settings. So far, the team has settings for ABS and PLA. ABS is a hard, sturdy plastic. PLA is a lower-melting plastic found in some disposable water cups. It’s like the preset buttons on a microwave, says Oosterman. Push the “popcorn” or “hot dog” button, and the machine will run for a specific length of time. They can add new buttons for one or more other types of plastics, he adds. Users also will be able to download new settings from the Internet. “You can still set the temperature and pressure” to customize the settings for other types of plastic, Oosterman says. Users even can add dyes to make different colors. Or they can mix colored plastics together the way they might blend paints. “I really like the thought of being able to save money and resources by utilizing what are essentially waste materials,” says David Kehlet. He is a development engineer in the Engineering Fabrication Laboratory at the University of California, Davis. Kehlet did not work on the new machine. UC Davis students use 3-D printing facilities at the “Fab Lab” to make prototypes of their engineering designs. “The costs of the consumable materials can really add up over time,” Kehlet says. But he wonders how much waste a home user would need to make the ink machine practical. Safeguards against fumes also should be in place, he adds. Oosterman’s team has already applied for a patent for its new design. Meanwhile, the students have formed a company, called ReDeTec, to sell the machines. The first recycled-ink makers will probably go on sale later this year. Then the team’s machine can help other people engineer their own inventions. 3-D printing The creation of a three-dimensional object with a machine that follows instructions from a computer program. The computer tells the printer where to lay down successive layers of some raw material, which can be plastic, metals, food or even living cells. 3-D printing is also called additive manufacturing. acrylonitrile butadiene styrene (abbreviated ABS) This common plastic is popular as an “ink” in 3-D printing. It’s also a principle ingredient in many products, including safety helmets, Lego® toys and other items. polylactic acid (abbreviated PLA) A plastic made by chemically linking long chains of lactic-acid molecules. Lactic acid is a substance present naturally in cow’s milk. It can also be made from renewable sources such as corn or other plants. It can be used for things such as 3-D printing, some plastic cups, films and other items. recycle To find new uses for something — or parts of something — that might otherwise by discarded, or treated as waste.